Wendy, aka AES Buzz Four, is a cute, 9-year-old black female born October 14, 1998. Her sire is Bara Buzz and her dam is the Irish-bred Generous Flyer. She has 107 races to her credit, starting July 4, 2000, at Corpus Christi track and ending June 5, 2002, at Gulf Greyhound Park in La Marque, TX. Wendy was taken by animal control from a neglectful situation in Waco along with a Schnauzer. Wendy was heartworm positive, and her treatment began on August 24, 2007, and she was heartworm negative finally on January 7, 2008. It is now time for Wendy to find her forever home and couch! Wendy is cat tolerant. 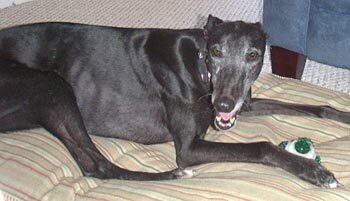 While Wendy has been in heartworm treatment, she's been living the good life in a home with another female greyhound. 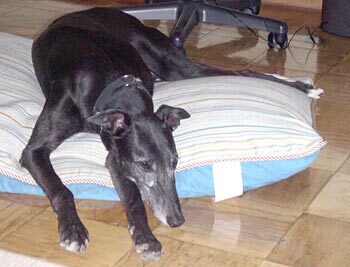 Like most greyhounds, she would love to have a buddy in her adoptive home. She and her foster sis get along greyt!! She was potty trained by her foster sibling. Wendy went outside every time Amy did so she learned quickly what was expected of her. Her foster mom is at home much of the time. Although crated, Wendy does not spend a lot of time in her crate – but when does she's a good girl. She seems to be a rather passive girl and doesn't try to be the boss. When she is outside by herself, instead of barking to come back inside, she patiently waits until someone opens the door. Consider adding Wendy to your family. She'd be very greytful.